Currently, an international tournament of tennis is happening right now is Australia. They are continuing their tradition of the Austrailian Open in Melbourne, Australia. This is a massive event that spans from January 16th-29th with tons of matches across different divisions happening each day, AND across several sites. Just take a look here at the different stadiums and grounds maps used to organize the event. 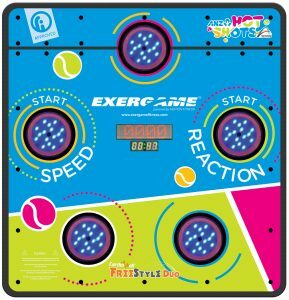 One of the things that will be featured at the Australia Open is an Exergaming product from us, the CardioWall Freestyle in the interactive kids & family area. This machine is perfect for this event simply because of how simple it is to pick up and play. People from all over the world are at the event, but no matter what the language everyone can see what you do: eliminate the targets. It’s also ideal for the amount of traffic that it will receive at this event, it is a high-quality durable machine that can handle people playing on it all day. You can see on the side a photo of the CardioWall Freestyle front plate: the CardioWall surfaces are customizable, ideal for corporate events and trade shows. 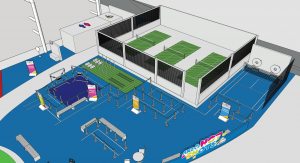 There is also a layout of the AO Ballpark “hot Shots” area where the CardioWall will be held. Finally, below there is a video featuring the Freestyle at a Trampoline Park so you can see it in action! Follow us on Facebook and Twitter for more Exergaming news and updates. Want to know more about interactive fitness & Exergaming? Contact us! Stay tuned for more updates and news on interactive fitness & Exergaming!